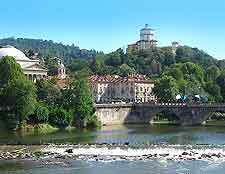 Sited at the meeting point of both the Dura River and the Po River, Turin is famed for its rich Baroque character and many spacious boulevards. Turin is also home to more than its fair share of historic arcades, grand architecture and street cafes, and is known throughout the world for being the home of the world-famous Turin Shroud. 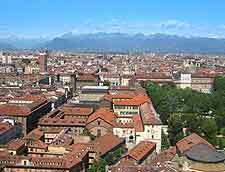 The city also boasts a thriving tourism industry and wealthy business centre, with numerous different industries based in the area, having grown to become the regional capital of the Piedmont province. On the far northern and western areas of Turin, the snow-covered mountains of the Alps offer an impressive distant backdrop, while the city centre is dominated by the late 19th-century Mole Antonelliana on the Via Montebello, an iconic symbol of the city and actually Europe's highest brick building. Many famous relics and attractions dominate the tourism scene in Turin, although the most iconic attraction is without doubt the Turin Shroud, which is located within the city's cathedral, the 15th-century Duomo di San Giovanni. However, the Shroud itself is safely locked away and tourists are usually only able to view a large photograph. The Superga Cathedral is also worth a look, as are Turin's numerous palaces, which include both the Palazzo Reale (Royal Palace) and the Baroque-style Palazzo Cavour. 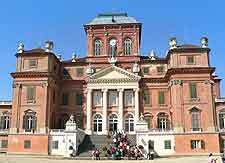 More information about Turin Tourist Attractions. Those in search of something to photograph will soon discover that Turin is filled with beautiful buildings and landmarks, with the Mole Antonelliana being amongst the most impressive, boasting a popular observation deck. The Piazza Castello is always of interest for tourists, as is the Lingotto Centre, a historic car factory, which featured prominently in the 1969 movie, 'The Italian Job'. 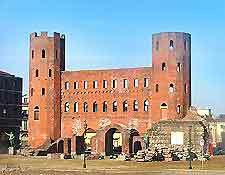 Also of note is the Castello del Valentino and its stylish Italian architecture, and the ancient Roman Amphitheatre, which dates back almost 2,000 years. More information about Turin Landmarks. In total, Turin is home to some 150 different museums and galleries, which come in all shapes and sizes, and cover endless subject matters. The Museo Egizio (Egyptian Museum) is renowned across Europe for its priceless Egyptian treasures, while for a spot of natural history in Turin, the Museo Regionale di Scienze Natural is a must. Housed within the Mole Antonelliana itself, the Museo Nazionale del Cinema (Museum of Cinema) is often of interest. Art lovers should not miss the Galleria Civica d'Arte Moderna e Contemporanea or indeed the Museo Civico d'Arte Antica. 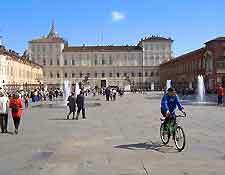 More information about Turin Museums and Turin Art Galleries. Many tourists visiting Turin rarely choose to venture outside of the city boundaries, while for others wishing to explore the Piedmont area and the province, plenty of interesting towns await. These include the neighbouring towns of Alba, Aosta, Avigliano and Saluzzo, all of which are popular destinations for day trips. Tourists from Turin also often choose to visit the mountain resort of Crissolo, where both hiking and skiing are just some of the seasonal activities on offer here. More information about Turin Attractions Nearby.